Cigarette smoke and other air pollutants affect the respiratory organs and can lead to lung cancer, one of the most common tumour diseases with a high rate of mortality. The reason: Our body doesn’t sends early warning signals. The disease is usually diagnosed far too late and can therefore hardly be treated successfully. Regular check-ups are therefore all the more important for persons at risk. A conventional X-ray examination is not sufficient for this. 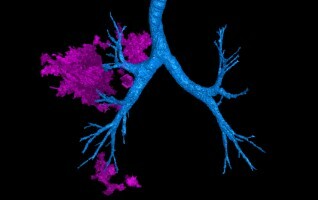 It makes sense for smokers aged 40 and above to have lung screening at regular intervals. The radiation dose from our BRILLIANCE CT 6-slice scanner from Philips is so low that we can even recommend an annual lung check-up to heavy smokers (low dose technology). Lung screening with our high performance CT only takes a few minutes and is absolutely painless. In spite of the low radiation dose, a special 3D-software is able to detect suspected tumour foci of only two to three millimetres in size. For this the system scans the trachea and the bronchial system thoroughly. When required, the informative value of this so-called virtual bronchoscopy can be increased still further through the administration of contrast agents. Lung screening with our high performance CT only takes a few minutes and is absolutely painless. When required, the informative value of this so-called virtual bronchoscopy can be increased still further through the administration of contrast agents.